Confession: I am a hoarder. Especially when it comes to scrapbook paper. I buy it, but I don't use it. I keep it. In my paper organizer. Where no one sees it, even me. If it's really beautiful, I have a hard time using it at all. Ever. I buy and buy and buy more paper. Have I made myself any scrapbooks? NOPE. (To my credit, I DO make scrapbooks for other people, just not myself) . I bought the text block and book board from the Paper Source, which is a beautifully creative company. There are two Paper Sources in Boston. I had to go to Boston to the dentist (Which I HAAAATE) so I treated myself to a trip to the Paper Source to salvage the trip. I started the process thinking I would post a tutorial. Then I realized I'm not good at that, because I forgot to take pictures of like 5 steps. I'll try better with the next one. 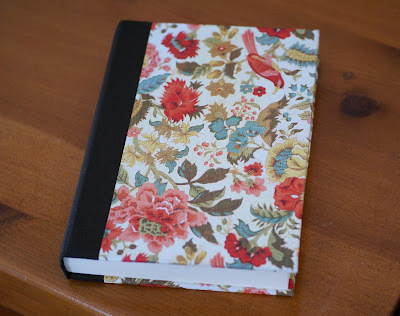 This is the third book I've made and I really like it! And I used paper! From my stash! It's beautiful! I know what you mean about your pages looking a little drab later. That's why I'm so happy to be a digital scrapper now! If I go back to something and decide it's boring, it only takes a click of the mouse to "fix" it. Now my paper goes for cardmaking, although I haven't done that in forever! I found you through Sew Mama Sew and added you to my bloglines! I too hoard scrapbook supplies. I love them so!